Co-Creation Chemistry: Co-Creation follows the following three steps: (b) formed by the atom-soul-actions of H(172) inside Set-3 (0-36 Octaves); (c) guided by the atoms respective spirit-potentials embedded in the involution logic of H(172) inside Set-1 (72-108 Octaves); and (a) output in groups of atoms forming molecules into Set-2 (36-72 Octaves). The atom in these molecules contains a physical nucleus bound with an electron shell separated by a 3-D space. Notice, the outputs are molecules rather than atoms. The atoms are always in a semi-stable state of becoming a stable molecule. These semi-stable states are the changing logic of the periodic table, or the changing magnetic potentials (or monopoles) to stable electric dipoles. All three steps are bound together by the fine structure constant and number constants together with other physical constants. Matter-Being physics is the physics at the crossover, where the non-local Holon Logic-Information—Information-Energy—Involution-Evolution operates in creating a possible synthesis between Creationism with Cosmology, Intelligent Design with Evolution, Spirit with Non-locality in Logic, Soul with Quantum Wave … and finally Ancient Wisdom (e.g., I-Ching logic as shown below) with Modern Physics. Here involution is defined as the logic that guides evolution, with their differences equal to entropy. First Cause, Biblical Logic: “As for God, His WAY is perfect”. “The Law of the Lord is perfect”. E. W. Bullinger stated in Number in Scripture, “They are both perfect in power, perfect in holiness and righteousness, perfect in design, perfect in execution, perfect in their object and end, and may we not say, perfect in number.” And I would say, God’s Law is locked in number 9. God is a non-local observer. His input that started the First Cause is locked in number 9, operated non-locally in base-9 (i.e., modular 9) arithmetic. Number 9 is not in the pre-heaven octagon (see diagram below). Locked in number 9 is the pre-heaven octagon with numbers 1 to 8 and their corresponding line diagram logic; namely trigrams of yin (— —) and yang (——) lines. Also, locked in number 9 is free will, denoted by a neutral line (— — —). Thus, in these trigrams, the free wills to pick yin or yang lines in their formation has been decided. These trigrams are referred to as thought particles in forming the logic components of elementary particles (see Part III of Chapter Two). In addition number 5 is not in the post-heaven octagon. 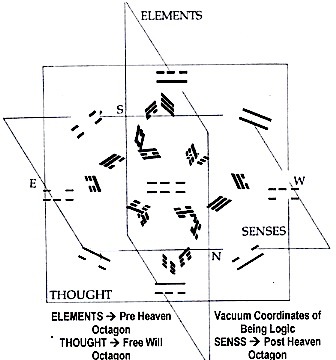 Embedded in number 5 is the post-heaven octagon with its mappings of numbers and trigrams. Notice the symbolic similarity between yin-yang lines and open-closed strings in String/M-Theory. In the logic of the virtual-vacuum computer, yin-yang lines are the bits, while yin—yang—neutral lines are the qubits. God’s First Cause is a Vacuum Computer. This computer is in inner space, i.e., inside zero. Outer Space is outside zero. Numbers in inner space are qualitatively defined and have personalities correlated to line logic diagrams. Numbers in outer space is quantitatively defined, e.g., in meter readings, and formulated by math operators. 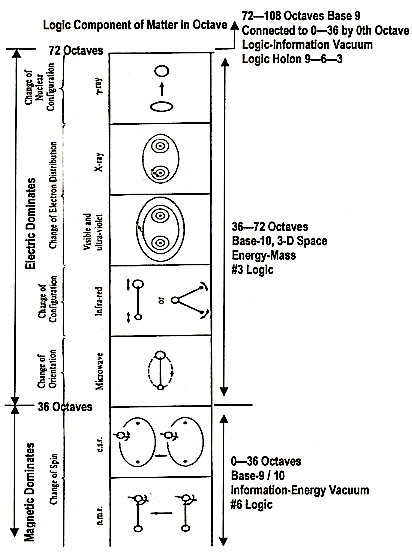 In addition to wave and particle, the logic component of elementary particles is defined with computer logic line diagrams (see Part III of Chapter Two of the Book). Their activities are in 11 logic-information dimensions, rather than physical dimensions (i.e., 9-number, free will, plus the dimension of love in inner space that corresponds to gravity in outer space). The 9 number dimensions are mapped into the following 9 line diagram dimensions: yin, yang, neutral line, and the six line dimensions in the hexagrams. This map, in the form of trigrams, is shown in the above diagram by 3-octagon arrangements. These dimensions are entangled in an uninformed observer state in a field of free wills, which are illustrated in the above building an Ark diagram. The diagram below illustrates the communication between the line diagrams, namely between tetragrams with the changing neutral lines (the key) and hexagrams (the lock) and between their embedded bigrams, trigrams, and the yin-yang bits. Being Logic at Crossover, the Transition Now State: At the crossover, transition between Matter Logic and Being Logic is where the programs of the virtual computer are created and co-created. The transition physics involves the non-local connectivity of the following Holons: Symmetry Breaks in Number-Dimensions—Line-Diagrams—Free-Wills, Conservations of Logic-Information—Information-Energy—Involution-Evolution, and the formation of Holographic grids in 3-D Space—Physical-Constants—172 Bio-Atoms, Nuclear—Atomic—Particle, Connectivity of Isotopes—Fermionic-Condensates—Bosonic-Condensates, Particle-Antiparticle coupling in β—γ—α Decay/Synthesis, Living-Nonliving connected via information and/or magnetic monopoles in DNA—Acu-Points—Chakras, Junk-DNA—RNA—Crossover, etc.. These non-locally connected Holons are modules within God’s Vacuum Computer, self-programmed in line diagrams. Formulated in these modules are the logic-information potentials of the universe. Their corresponding physical forms are monopoles and magnetic monopoles. In short, this is a 10-information-dimension spintronic living computer. A very primitive example of a line diagram computer is the Lo Pan, an ancient 18-ring (18 -> 9 + free will is 10 information dimensions) slide rule as show below. The Lo Pan calculations are based on the 8 trigrams and 64 hexagrams plus free will, in 27 information dimensions namely, 10 stems, 12 branches, and 5 elements. 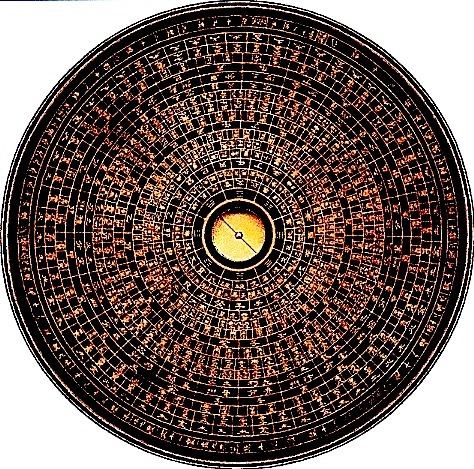 The Lo Pan is not only an astrological computer but also a diviner’s plate to compute the astrological-human (or the observer) non-local/local information/entropy connections (or Ch’i/Qi connections). The examples for the H(172) non-local/local logic for the three categories of (a) Bio-Atoms in 36-72 Octaves, (b) DNA in 0-36 Octaves, and (c) Acu-Points in 36-72 Octaves are formulated in line-diagrams, the language of God’s Vacuum Computer. The three modules of H(172) are self-encoded in a common program. The transitions at the singularity crossover inside the information vacuum between (c)-(a) and (c)-(b) are a computer execution of this computer program in the form of information-energy satisfying the related logic potentials known as information-magnetic monopoles. Finally Creation or Co-Creation is, the outputs, of God’s computer. The details are discussed together with the illustration of the line diagram models for elementary particles, bio-atoms, DNA, Acu-Points, and so on are in various Chapters Two and Three of the Book. The design, as argued in this book, is created / co-created by a set of common involution logic encoded in God’s vacuum computer. I use the word God because there exists no term to identify the input of number 9 that started this self-programming vacuum computer via symmetry breaks into the three-octagon coordinate system. The word God is as good as any other term such as the Creator, the Inputer, and so on. The Who-What of God is unknowable, since He, She or It is outside of our universe and thus outside of human understandings. This universe started with a First Cause by God’s input of intelligence into number 9 and it’s embedded in three Octagons as an absolute set of coordinates. In this First Cause, the thought octagon contains the free-will of God. 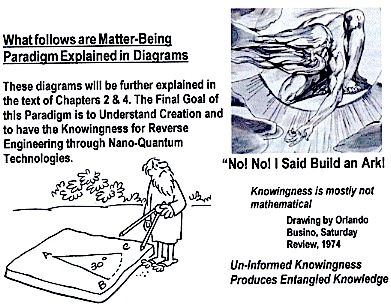 Embedded in number 9 are the involution logic for pre-post heaven octagons and the logic-language for His self-programmable vacuum computer. This set of logic [e.g., yin-yang lines] represents the universe’s (initial-conditions)—(Evolution-logic)—(Final-conditions) and became a set of locks. The Second Cause has to do with co-creations by the Thought Octagon in an observer-observed state that satisfies the lock-key relationships. Entropy is those misinformed logic differences between involution and evolution. This set of locks became the fine tuning instructions. Involution—Entropy—Evolution are encoded in the computer connected to the singularity of Mind—Soul—Spirit and Logic—Information—Energy crossovers.